The arc that ended up being the final aired one for The Clone Wars wasn’t intended to be a series finale, but it had to function as one for a while, until the partially completed sixth season was released on Netflix. When I first watched this arc, however, a few months ago, there wasn’t any word yet on whether they would ever see the light of day, but I found these four episodes to be among the best the series ever accomplished, and ones that also would have made a genuinely satisfying emotional and thematic climax to this 108-part story, if it were necessary. Even though there are still dangling threads (some of which are picked up in the sixth season episodes), the major question of why Ahsoka isn’t in Episode III is answered–she doesn’t die but rather leaves the Jedi Order, and the exact reason she does so proves to be one of the most damning statements against the ancient knighthood in this era, beautifully setting the stage for its almost total annihilation via Order 66. It also adds yet another layer of depth to Anakin’s complicated relationship with the Council. One can easily imagine the circumstances that lead to Ahsoka’s exit, as well as its fallout, being yet another major bone of contention between Anakin and the order whose philosophy he had always struggled to uphold. When watching the prequel trilogy on its own, one might wonder just what tipped Anakin so far over to being susceptible to Palpatine’s manipulations, and while it is certainly rooted in psychological baggage that could be extrapolated from the films alone, one of Clone Wars‘ greatest accomplishments has been to realistically depict this gradual process. What it needed, however, was one major straw-that-breaks-the-camel’s-back to truly cement Anakin’s growing distrust of the Council, and for him to have lost his Padawan not through death but due to the Council failing her when she needed their support the most is an event of such a level of significance. I had always had a bit of trouble reconciling the Anakin from the start of the prequels with the one in Episode III, not so much on a logical level but on a gut level. I could understand how the events of the films could affect him as they did but sometimes had trouble feeling it. What Clone Wars has done for me is to fill in crucial pieces of his character development and in so doing strengthen and improve the overall Star Wars saga. Before I saw the show, I had trouble fully accepting Anakin’s turn to the Dark Side, but this show has depicted Palpatine’s gradual, insidious influence so well, as well as the Jedi Council’s own mistakes and Anakin’s philosophical clashes with them with such narrative depth and mastery that I now feel like I can understand the character as I never did before. I can easily imagine the Anakin I’ve seen developing over the past five seasons finally lose his anchor without Ahsoka there. Ahsoka started out as a bit of a nuisance to Anakin, a young, fresh-faced Padawan learner thrust upon him before he was even given the full status of Jedi Master, as a test of his abilities, including that of being able to let go. Over the course of the show, she went from being his pupil to taking on a similar role of that of a kid sister and eventually moral compass for Anakin. He can relate to her in a way that he hasn’t been able to with any other Jedi, including Obi-Wan, because, from the start, she shared his impetuousness, youthful vitality, and hotheaded impatience. In some ways, however, she grew into an even better Jedi than he, learning how to control her emotions and calm her mind better than he ever did, and so while he was her Master, she often became the one setting an example for him. He didn’t want to let her down. And so one could see that he might interpret the loss of Ahsoka as a failure on his part to a degree, as well as an even stronger indication to him of just how far the Jedi Council has fallen. 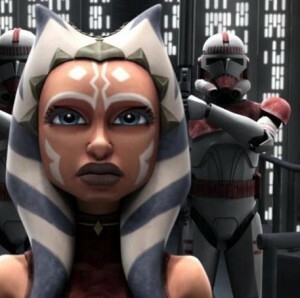 The plot of these episodes revolves around Ahsoka being framed for the murder of a woman involved in a terrorist attack on the Jedi Temple, an explosion that was actually planned by her old friend, Barriss, who later secretly murdered the woman in her jail cell while Ahsoka helplessly watched. Over the course of the episode, a mix of Barriss’ machinations and bad luck conspire to create circumstantial evidence that continues to pile up against Ahsoka, a major example of the latter being her teaming up with Ventress to help clear her name, only to look even more guilty by association with her in the process. What is so brilliant about the entire scenario is how convincingly the case against Ahsoka is built. A lesser show might have not made as strong an argument for why the Jedi might be hesitant to believe her innocence, and in so doing would have had to illogically force the characters to behave according to the dictates of a plot that didn’t make sense with what we know of them as people. And yet, although it’s extremely frustrating to watch, the show does create enough easily-misinterpretable evidence against Ahsoka that one can see why even her closest allies might have cause to doubt her. However, as Jedi, they should still have had more faith. They know Ahsoka and how devoted she has always been to their cause, and she deserved the benefit of the doubt. Part of the problem is that, at this point, in these dark and troubling times, the Council has become so concerned by the pernicious influence of the Dark Side that they have grown paranoid that anyone at any time could be won over by its tantalizing call. As the Star Wars series has shown time and time again, being a champion of the Light Side is difficult. One has to accept loss and setbacks without falling prey to completely natural anger or the desire for revenge, and often, sticking to the Jedi code can be detrimental to the very act of winning a battle. How much easier is it to simply use the Force to block off an enemy’s air flow until they are defeated in battle or, during interrogation, agree to tell you what you want to know than it is to hope to convince them by other means? But because it offers such a seemingly easy alternative, it can lead to the paranoid belief that every Jedi at any given time is just one minor push in the wrong direction away from losing their moral compass. It leads to a lack of trust of anyone who demonstrates the slightest signs of impetuousness or emotion. On paper, Ahsoka might seem like a “risky” Jedi, as does Anakin, but as someone who has never demonstrated any behavior that might indicate she would ever betray the Jedi, they should have taken that into account, despite the evidence. And the sad fact of the matter is that it is largely a political move. They are worried about being perceived to be showing favoritism to one of their own in the eyes of the Republic, and so they strip Ahsoka of her Jedi status so that she is able to be tried by the Senate. Otherwise, she would fall under the protection of the Jedi Council, and it would have been an entirely internal matter, which it likely should have been in the first place, given that the initial attack was on the Jedi Temple and that the woman who was killed had also been directly involved in that terrorist action. The Jedi basically sell her out in order to protect their own standing with the Republic, thus ironically proving the very statement that the actual saboteur and murderer, Barriss, had meant to convey all along. I did it because I’ve come to realize what many people in the Republic have come to realize: that the Jedi are the ones responsible for this war. That we have so lost our way that we have become villains in this conflict. That we are the ones who should be put on trial. All of us! And my attack on the temple was an attack on what the Jedi have become: an army fighting for the Dark Side, fallen from the Light that we once held so dear. This Republic is failing. It’s only a matter of time. And the thing is that, in many respects, Barriss is right. Now, her methods are completely wrongheaded. The use of deadly violence to protest violence significantly damages her position, and she is not completely right about the Jedi having caused the war. In fact, they were manipulated into it by Palpatine’s machinations. However, the fact remains that they allowed themselves to be played by Palpatine, because they had so drastically lost their way over the years, and furthermore, their subsequent actions only caused them to drift further from their original purpose. One of the central ironies of the series has always been that while, on the surface, any given successful battle might seem a triumph for the Jedi, the fact that they are taking part in this war at all is slowly but surely laying the groundwork for their own destruction, although they are too blind to see it, and so it is enormously fitting that in one of the final episodes, someone who used to fully believe in the Jedi ideals confronts them with this. As in any classical tragedy, the Jedi have sown the seeds of their own undoing, along with the Republic’s, and never is that more apparent than when they abandon Ahsoka in her hour of need in order to protect themselves. Which leads us to what might be the most anger-making act of the Jedi Council in the entire series: when they do finally admit that Ahsoka hadn’t betrayed them and offer her her place back amongst the Jedi ranks, they have the gall to act as if she should be grateful to have been extended this courtesy. Windu even goes so far as to tell her that she should retroactively consider it a test of her resolve and strength, and one that she passed with flying colors, which is misguided on every level and speaks to the Jedi Council’s astounding hubris. It never occurs to them for a moment that Ahsoka might not jump at their invitation nor that a heartfelt apology on their part would require them to truly understand the depth of how they have wronged her. They were her family, and they turned on her, casting her out, and yet they don’t see any reason that congratulating her on having been right all along isn’t good enough. They never admit full responsibility for having been throughly wrong. And although we never get a chance to get inside Ahsoka’s head to learn exactly what her thought process was in rejecting them, the implication seems to be that they hurt so deeply, it wasn’t enough for them to basically say, “Oh, well, everything’s fine now, back to work.” They emotionally abandoned her and she can see that when the Jedi Council of all places behaves that way, all is not right in the state of Coruscant. Barriss said some extremely cutting things about what the Jedi have become, and my reading of it is that, while Ahsoka doesn’t condone her former friend’s actions, she has–perhaps for the first time–come to truly question the Jedi. I don’t necessarily think that she is fully aware of all of these emotions in that moment, but I’d be surprised if all of this weren’t playing out in her mind, at least subconsciously. On some level, I think she also does blame herself, whether that is rational or not. From her perspective, her adopted family rejected her, and it’s very difficult to be rejected by one’s family without thinking poorly of oneself. The brilliance of these final moments is how they drive both Ahsoka and Anakin’s arcs. In many ways, Clone Wars has always been Ahsoka’s story. Whereas Anakin’s was a foregone conclusion, Ahsoka always represented a big question mark, and in the end, the show establishes a clear link between Ahsoka’s decision and the far darker one Anakin will make in the near future. The loss of Ahsoka breaks his heart, and although there is no scene between Anakin and Obi-Wan in this episode, one can tell from his reaction to the Council’s initial decision to cast Ahoska out that his Master has once again deeply disappointed him. Obi-Wan himself seems ashamed of it. And there is enormous dramatic irony throughout these episodes, as we watch Anakin struggling first to clear Ahsoka’s name and then to convince her not to leave the order. Although he has had trouble reconciling the Jedi’s code with his own personal one–in one of the arc’s darkest moments, he again uses the verbotten Force choke, ironically the very thing that Barriss used to frame Ahsoka in the first place–he is still a loyal Jedi at the start of these episodes. It is only the Jedi’s own actions that cause him to being to lose faith in them. Another moment of extreme dramatic irony: when Anakin’s battle against Barriss moves outside the Jedi Temple, interrupting a group of Younglings, which once again obliquely reminds us of that horrific moment steadily approaching in Anakin’s future. And there is also, of course, the fact that when it seems that Ahsoka has turned on the Clones, forcing them to hunt her down, it eerily foreshadows Order 66 and is yet another example of how, despite how closely they fought together, the Clones would be willing to put down a Jedi who became a threat. This happens numerous times throughout the series, but since we are getting so close to Episode III in the timeline here, it becomes all the more frightening. Despite moments of humor and triumph, Star Wars: The Clone Wars has always been a deeply tragic story, and the final moments of Season 5 pay tribute to that. Although it is heartbreaking to see such a beloved character as Ahsoka’s story end for now on such a down note–which is why I’m thrilled by the rumors that she’ll be a part of Star Wars: Rebels, the upcoming animated series set between Episodes III and IV–it’s crucial to the narrative that the end of her Clone Wars story is tragic. Luckily, her character doesn’t die here but instead lives on, and I’m hoping becomes an important part of the early years of the Rebellion, fighting to uphold what her former Master told her, despite the fact that, by that point, he will have lost his way to a far worse extent than the Jedi Council ever did. I have to completely disagree with you that the case against Ahsoka was convincing in the least. As you stated, all of the evidence is circumstantial. Sure, the events of the episode would be (mostly) consistent with Ahsoka being behind everything, but it’s also very obviously consistent with her version of events. There is literally no evidence against her which is strong enough to lead to a conviction, by which I mean it can’t prove beyond reasonable doubt that she is guilty. Enough to be believable to most children? Sure, and I get that that’s the target audience, but this kind of crap really irks me and shattered my suspension of disbelief, so I had to rant about it somewhere.